Concept - On site survey carried out, getting a quote, project discussion, advice given on planning permission, party wall agreements etc. Design - We can use existing planning drawings or alternatively we can provide our very own in house architect to draw up the plans and submit for the required planning approval. 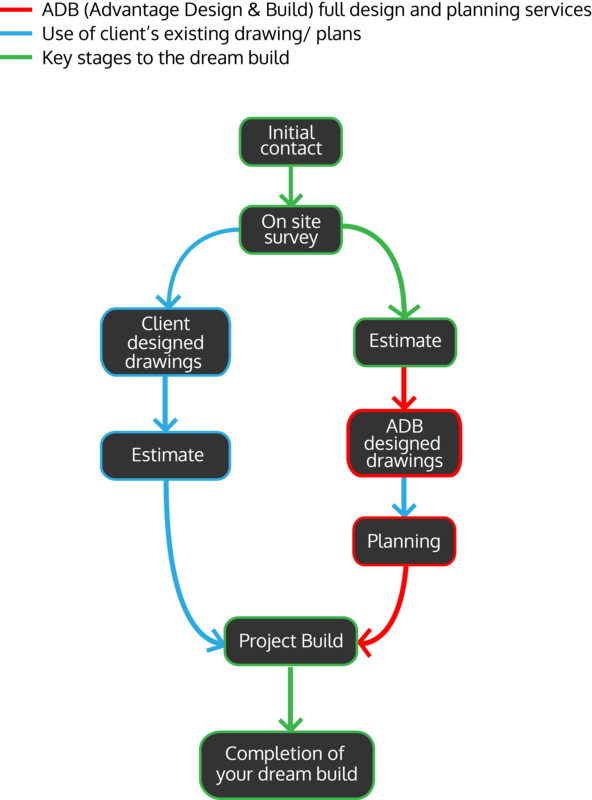 Build - We provide detailed information to our client regarding all the stages of the project build together with the expected completion date for the project. We take pride in providing our customers with expert advice throughout all phases of your build. And although we think modern, our team is traditionally trained and is dedicated to high-quality workmanship using the latest techniques. Advantage Design & Build delivers a wide range of services, and for further information you can call us on 0800 0852995 or use the contact form at the bottom of this page to truly outline what you need. Advantage Design and Build Ltd.